Mr. Timothy Merlyn Reed, Sr., age 62, of Springfield, Missouri, formerly of Clever, Missouri, went to his Lord and Savior Jesus Christ on Tuesday, March 19, 2019 in Birch Pointe Health and Rehabilitation, Springfield, Missouri. He was born on November 6, 1956 in Kearney, Nebraska, the son of Merlyn Gerald Reed and Joyce E. Mary. Timothy served his country in the U.S. Army. He was preceded in death by his wife of 40 years, Cynthia Kay (Logan) Reed; and his father, Merlyn. Timothy is survived by a daughter, Kimberly Daniels and husband Travis; a son, Timothy, Jr. Reed and wife Gina; three grandchildren, Avery K. Daniels, Elora Reed, and Corey Reed Daniels; his mother, Joyce; a sister, Debbie Johnson; and many other extended family and friends. To send flowers or a remembrance gift to the family of TIMOTHY MERLYN REED, please visit our Tribute Store. 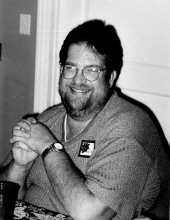 "Email Address" would like to share the life celebration of TIMOTHY MERLYN REED. Click on the "link" to go to share a favorite memory or leave a condolence message for the family.